Who could you sponsor right now? Where do you have influence? Is there someone who you can open a door for who is a different gender or background than you? Are you praying about finding a mentor/sponsor? Are you meant to take a next step in approaching someone or keep sowing in prayer right now? Today on this Lead Voices episode of The Lead Stories Podcast Jo and Steph talk with Natalie Manual Lee - Executive Producer and host of Now with Natalie on the Hillsong Channel. Do you have a tribe? Join Jo and Steph as they talk about the why and hows of maximising your tribe and the barriers to them. ‘Now he's using you, fitting you in brick by brick, stone by stone, with Christ Jesus as the cornerstone.’ Ephesians 2:10 - Message translation. Do you desire to have an ‘oikos’ - an extended family that is committed to you? Have you prayed about it? What is God saying about the next step? Do you feel a spirit of competition or a spirit of helping others when it comes to available opportunities? What opportunities are available to you right now for building community that you could step towards courageously? Listen in today (and be moved!) as Steph shares about her recent trip to Uganda and what she encountered regarding the celebration of leadership and women there. Listen in also to hear an introduction to the new Lead Stories series - ‘Maximizing your leadership’. How would you feel if someone celebrated and literally danced when hearing your calling? Read Zephaniah 3:17 and reflect. When you think about your leadership, what things help you be most effective? This episode originally aired in the Lead On series in November 2017. When you lead you will be criticized. So how can we lead on in the midst of criticism? Jo and Steph talk from personal experience about how they have received criticism and how to filter negative feedback without getting bitter or discouraged. What have you not done for the Kingdom because of the fear of rejection or criticism? What inner critique do you have of other leaders that you haven’t processed yet? What is at stake if you don’t lead on in the midst of criticism or potential criticism? Journey with Pastor Steph and experience the moment when a community gets fresh water for the first time! You can also see photos of what you are hearing! Spring Break Replay during the month of March! Enjoy these previously published favorites! Also, check out this link to download a copy of "Lead On: A Resource for Leading in the Midst of Anxious Times"
We need practical tools to help us thrive in a world of comparison and competition, which so often begins with our minds! This week Jo and Steph talk about internal and external struggles with comparison and competition and how we can practically face them head on, changing our mindsets, practice and culture. 1. Where is your biggest struggle with comparison and competitivity right now? Internally or externally? 2. How easy do you find it to affirm and encourage others who are doing what you want to be doing? Who can you encourage today? 3. How clear are you on your vision and what God has called you to do? You could start by writing out a list of the things you are clear on - your gifts, calling etc. Knowing what we are called and gifted to do can help us not to compare so much with others. 4. Jo said: “In a competitive mindset, you have just given others something God has given you, but in a God-given mindset you have just multiplied”. Jesus desired his disciples to go further and do more than he did. How do you feel about discipling others who may do more and go further than you will? Is there a mindset you need to repent of? What practical things can you do going forward to encourage, release and celebrate your disciples? Comparison and competition are as old as Cain and Abel. Rachel and Leah struggled with it and the disciples too. This week Jo and Steph discuss the difference between a scarcity and an abundance mindset and ask how we can create cultures where people can flourish rather than strive or withdraw. 1. Can you think of a time when you compared yourself to someone else and then gave up or withdrew from a situation? Where did you have a scarcity mindset? 2. Can you think of a time when you compared yourself to someone else and it made you want to strive to compete and be the best? What suffered as a result? 3. As a leader do you prepare for abundance or fear scarcity? Can you give some specific examples? Last week Jo and Steph discussed the Imposter Syndrome and this week they show you how to overcome it! Using the letter A (because Jo has loved Sesame Street since childhood) they are going to discuss 8 points which use the letter A. 1) Admit this a problem and begin to address it. 5) Accept an accurate view of yourself. 8) It is not about arriving - it never was. 1) Where can you identify the Imposter Syndrome influencing your ability to move forward? 2) Which of the steps above do you feel God is highlighting to you to focus on as you take Imposter Syndrome on? 3) Do you regularly take time to assess your strengths and weaknesses and make a plan moving forward? Is there someone else you can invite into this journey to do together? Jo and Steph discuss the ‘Imposter syndrome’ today, the feeling that many people have, even high achievers, that they just got lucky and are not as able as it appears. ‘Imposter syndrome’ is an internal insecurity and a fear that eventually they will be figured out and exposed for who they really are. It can cause anxiety, depression and fear. Listen in to hear Jo and Steph share their personal struggles with the imposter syndrome, and how important language is to help us own the callings God has given us. 1) Where have you felt the imposter syndrome present in your life? 2) Where have you held back in a meeting or pursing the vision God has given you because you don’t feel worthy yet? 3) Can you accept a compliment by saying ‘thank you’ rather than dismissing it? Join international speaker Pastor Laurel Bunker as she chats healthy and unhealthy sacrifices with Jo and Steph. Listen in to this passionate conversation to hear how she responds positively to the sacrifices of being a black female leader and what she does to sustain God’s call on her life without making unhealthy sacrifices. Can you name some positive sacrifices you have made in your leadership? Can you identify some negative sacrifices you have made in your leadership? Pastor Steph grew up with parents who understood the sacrifice of leadership in full-time ministry. Listen in as Jo interviews her about what her early understandings of leadership and sacrifice were and what being a leader has cost her as a woman and as someone who breaks many different stereotypes. How are you different from other people? What is your leadership ‘flavor’? Where do you particularly find it difficult to disappoint others? What things have you had to give us as a leader? Steph interviews Jo on the role of sacrifice in her leadership journey. Listen in to hear Jo discuss the sacrifices she has faced since her earliest leadership, as a single in her twenties and as a woman and mother leader as well as some of the sacrifices universal to us all. Can you identify a time in your life when you make a healthy sacrifice in leadership and a time when you made an unhealthy sacrifice? What is the difference in your opinion? Think about your leadership journey. What have been the greatest sacrifices? What have been the breakthroughs that have come as a result? What are some of the sacrifices of leadership that you can think of? Join Jo and Steph as they share some of the sometimes necessary sacrifices of leadership and also how we can approach them so that they don’t come as a surprise to us. Which of the sacrifices that Jo and Steph mentioned can you most identify with? Did it come as a surprise to you? Where might you be sacrificing where God is not actually asking you to? Where might there be a reluctance to sacrifice where God is asking you to? Embrace the positive and avoid the negative ways to engage with personality and strengths assessments as a leader. Listen in as Jo and Steph share how they can be helpful tools for leading and working as a team, with a particular focus on how to get the best out of Myers Briggs, Strengths Finder and Enneagram. Listen in to the end to hear about the new upcoming series! Which personality / strengths assessments tests have you found helpful? In what ways? Which of the negative ways these tools have been used can you identify with? What is your next step to engage with what God may be saying to you through these tools? Which of the 6 areas (spiritual, cognitive, relational, meaning, physical, emotional) do you want to make goals with for the next three months? Who are the people who can hold you accountable or join you in reaching your goals? Enjoy this new episode of Lead Voices, the companion podcast to Lead Stories, featuring our friends who will inspire, challenge, stretch and encourage you. Today's guest is Jessica Turner author and blogger who lives with her husband, Matthew in Nashville, with their silly 6-year-old son Elias, spunky 3-year-old daughter, Adeline, and newborn son, Ezra. Jessica talks today with Jo and Stephanie about the challenges of juggling a full schedule of work, family, and friends. The Learning Circle is today’s Tool of the Trade. Join Jo and Steph to learn how you can engage with God and respond and learn from life’s ups and downs. Kairos moment: an ‘aha moment’ or an event in our lives we want to learn from. Can you identify a kairos moment in your life right now that you would like to learn from? Who can help you do the ‘discuss’ and ‘account’ part of the learning circle? Can you think of a kairos moment in your life that you didn’t process and one that you did? What difference did processing make? Want to go deeper with the tools of the trade? Jo and Steph are holding a private SWOT Analysis training for 15 people. Sunday, January 27th, 7-8pm CST $44 Go to www.leadstoriesmedia.com/resources to sign up! We interrupt your regularly scheduled day to let you know there are 11 new Crafted Coaching 5 week groups open for registration until January 16th! Welcome to season 6! In this series ‘Tools of the Trade’ - there will be some tools to help with the ‘how’ of leadership. 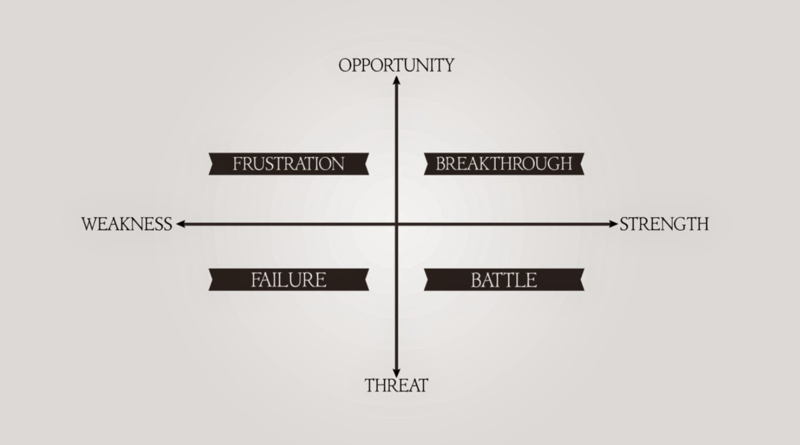 Today’s tool: SWOT Analysis: which stands for Strengths, Weaknesses, Opportunities and Threats. It is a diagnostics tool to help us examine our lives and be intentional going forward. Failures: Internal and external weaknesses. Frustrations: External strength but internal weaknesses. Breakthroughs: Where we are in a place of strength internally and externally. How about getting together with another friend or two and doing this tool together? You can ask those hard questions and keep one another accountable! 1) Looking at your SWOT analysis, what is God’s invitation in order to more towards breakthrough in any given area? 2) How do you approach failure? Are you able to detach your identity from them and see them objectively? Are you able to take them to the cross and allow God to resurrect them? 3) Steph talked about breakthroughs starting with a breaking. Where have you been broken in the past season that you can, with faith, look for God to bring breakthrough in this season? Want to go deeper? Jo and Steph are holding a SWOT Analysis training for 15 people. Sunday, January 27th, 7-8pm CST $44 Go to www.leadstoriesmedia.com/resources to sign up! Today's episode is a re-broadcast of an Advent sermon preached by Stephanie's Co-Pastor Michael Binder this December entitled "The Light of the World Radiates". Going into 2019, Jo and Steph are looking to equip leaders of teams and give them tools for leadership through the podcast and the online resources at www.leadstoriesmedia.com/resources. Today's episode is a re-broadcast of an Advent sermon Stephanie preached this December entitled "The Light of the World Orients". Today's episode is a re-broadcast of an Advent sermon Jo preached this December entitled "The Light of the World Exposes".